How many times have you arrived at work, exchanged greetings with your colleagues, attended a meeting or two, and then sat down at your desk overcome by the incredible feeling that you were surrounded by geniuses? If you're like most people, caught up in the stress of work and everyday life, the answer is a resounding "never " But that's all about to change. 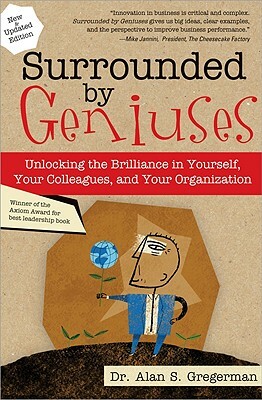 In Surrounded by Geniuses, Alan Gregerman presents a revolutionary guide to personal, professional, and organizational success based on two powerfully simple ideas: First, that there is genius hidden in all of us. And, second, that we are surrounded by a world filled with genius that can be used to transform any team, company, or organization in order to deliver compelling customer value. Visit the Surrounded by Geniuses blog for more ideas and insight on unlocking brilliance in yourself, your colleagues, and your organization. Dr. Alan S. Gregerman is the founder and president of Venture Works, Inc., a consulting firm based in the Washington, DC area, working with clients such as Marriott, Lockheed Martin, CitiGroup, and Verizon. He is a nationally known expert on business strategy and innovation. He is the author of Lessons from the Sandbox, and lives in Washington DC.